The CO2 level is an important factor in plant growth. During the process of photosynthesis, the plant transforms sunlight, water and CO2 into the carbohydrates it needs. CO2 deficiencies result in restricted growth, especially common in indoor growing with artificial lighting. An optimized CO2 level will help to grow bigger and healthier plants and generate bigger yields. Just secure your CO2 bag into the growing environment and it will do its job continuously, 24/7 for 30 weeks without maintenance or refill. USEFUL TIP: Place the CO2 bag above your plants, because CO2 molecules are slightly heavier than O2 molecules. With the easy and reusable Velcro fastening system you can place it anywhere. You can even attach one below the other. 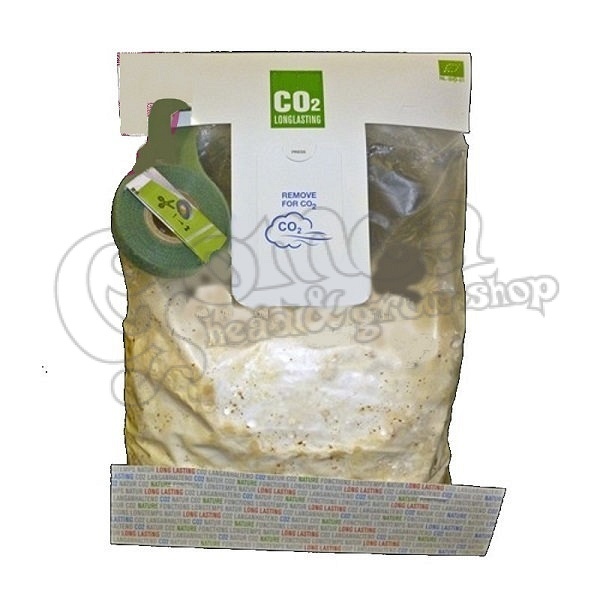 CO2 bag is a 100% ecological and bio-certified natural substrate, inoculated with a non-fruiting mycelium. While the mycelium grows into the substrate it generates CO2, which is being exhaled into the growing environment via the microporous breather patch.